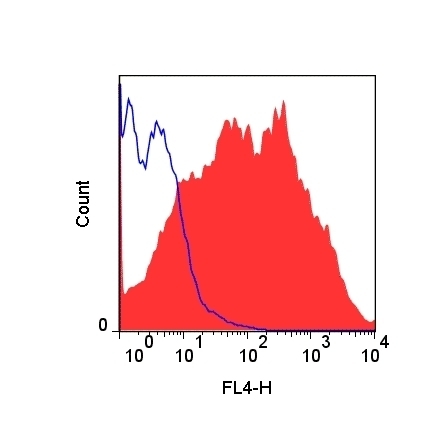 ELISA analysis of recombinant chicken CD25 (supernatant from transfected COS cells, 1/3 dilution) with Mouse anti Chicken CD25 antibody, clone AV142 (MCA5925GA). Supernatant from mock-transfected COS cells was used as negative control (Image courtesy of the Roslin Institute). 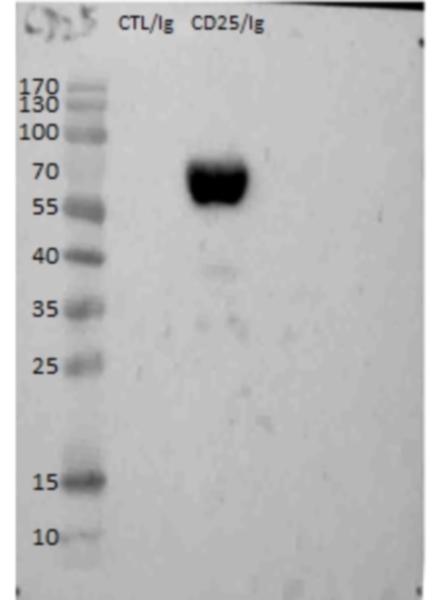 Western blot analysis of chicken CD25/huIg fusion protein with Mouse anti Chicken CD25, clone AV142 (MCA5925GA). Recombinant huIg was used as negative control (Image courtesy of the Roslin Institute). (Image courtesy of the Roslin Institute). Mouse anti Chicken CD25 monoclonal antibody, clone AV142 recognizes CD25, the chicken IL-2 Receptor alpha chain (IL-2Rα) which has been identified as the chicken homologue of human CD25 and is cited as ChCD25 in published literature. CD4+ve/CD25+ve and CD8+ve/CD25+ve cells are up-regulated following infection with avian influenza virus (H9N2) and may therefore have an important role in the immune response to avian influenza virus infection . Mouse anti Chicken CD25 monoclonal antibody, clone AV142 is one of a range of antibodies that have been developed by the Roslin Institute as part of the Avian immulogy toolbox project. In addition to this anti chicken CD25 antibody, other antibodies to chicken CD antigens and cytokines from this project are now available from Bio-Rad. Spleen cells from immunised BALB/c mice were fused with cells of the Sp2/0 Ag14 Myeloma cell line. This reagent was produced by the WellcomeTrust-funded National Avian Resource Facility (Grant number WT099164MA). This product is suitable for use in direct ELISA applications. Neulen, M.L. et al. 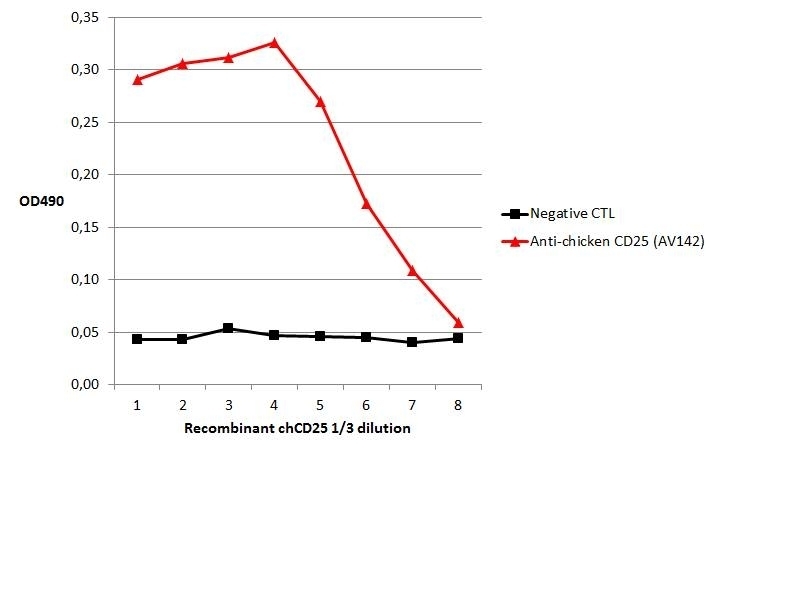 (2015) Identification of novel chicken CD4+ CD3- blood population with NK cell like features. Dev Comp Immunol. 49 (1): 72-8.